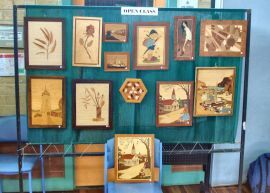 The marquetry society of Victoria has an active membership, and always welcomes new members. The society maintains an extensive library for the use of members, and books may be borrowed for a period of one month. The annual membership fees are $39, with a once off $6 joining fee. Workshops incur a $4 levy, to cover the cost of the lall. Membership is country wide, experienced, or beginner, all are welcome. Our members may be tutoring at other locations within the metro area - there may be one near you, so please ask. The fellowship of a unique group of craftspeople in Australia. A copy of Marquetry Matters, our bi-monthly newsletter. The opportunity to solve your individual problems. Easy access to veneer in small quantities. 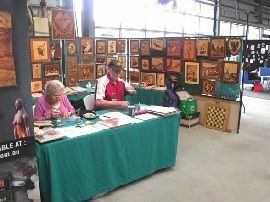 Short demonstrations/talks on various aspects of marquetry. counterparts in Great Britain, Canada, and USA. Regular workshops/Classes at Box Hill and Heathmont. Some of our members and work. Manning the stand at the Melbourne Timber and Woodworking Show 2010. Marjorie Tearle and Chris Burch hard at work. Each year the Society has it's annual X'mas display, and end of year 'do'. Members submit their chosen work under sections 'Open', 'Applied', or 'theme'. Entries are judged, and certificates awarded. 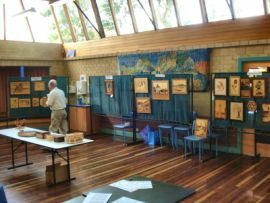 This pic shows the displays being setup for 2010, with Viv Wood looking somewhat harrassed in the background. Each year, the Society sets a theme for the year, which the members produce pieces for against a specified set of guidelines. 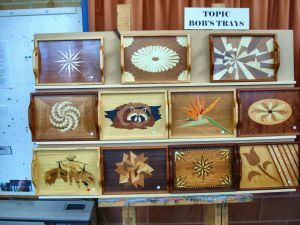 In 2010, member Bob Taylor offered to make up small tea trays, which the members were to decorate with marquetry. The theme is always aimed to allow marquetry newbies to be able to submit work, that they can feel is competitive with the more experienced ones. This years theme generated 18 entries, and a substantial amount of enjoyment. This picture shows one of the display panels generated. Some of the 'Open' section pieces on show X'mas 2010. 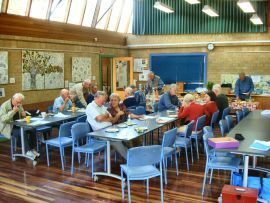 It's almost over for 2010, and members enjoy a final get together for the year.